Who said "well-behaved women seldom make history?" 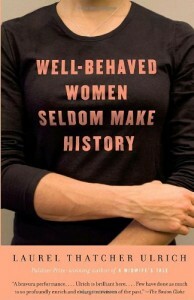 "Well-behaved women seldom make history." You may have seen that quote on bumper stickers or t-shirts, or maybe you've seen it as "Well-behaved women rarely make history." The quote often appears without attribution. I've sometimes seen it attributed to Eleanor Roosevelt and Marilyn Monroe. 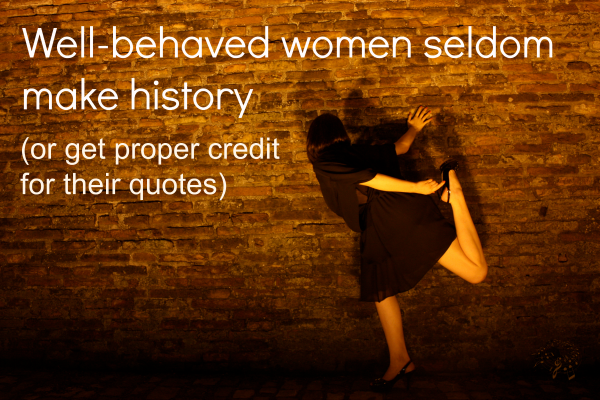 But who really said "well-behaved women seldom make history?" Pulitzer Prize winning historian Laurel Thatcher Ulrich. Ulrich wrote "well-behaved women seldom make history" in a 1976 article about Puritan funeral services. What? You didn't read it? Pfft. I did read Well-Behaved Women Seldom Make History, a book written by Laurel Thatcher Ulrich after she saw her words popping up on bumper stickers and coffee mugs. In the book, Ulrich explores the strange phenomenon of having her words take on a life of their own while also sharing the stories of some interesting women from history, who may or may not be considered well-behaved and who may or may not be known. When Ulrich originally wrote, "well-behaved women seldom make history" she didn't mean that women should misbehave in order to be memorable, which is how the quote is often interpreted. She wrote those words lamenting about the fact that so many women who made positive impacts on society are overlooked by history. Relatively few women have their names remembered. Women like Eleanor Roosevelt and Marilyn Monroe. Not women like Laurel Thatcher Ulrich. Quotes are often misattributed. Mary Tyler Mom has told her story of an inspirational quote attributed on a bottle cap to Martin Luther King, Jr. even though the words are from Martin Luther. And of course there are many misattributed quotes floating around on the Internet. Mistakes happen, but I believe in trying to give people credit for their words. The next time you see the quote "well-behaved women seldom make history" or even "well-behaved women rarely make history" you may not remember Laurel Thatcher Ulrich's name, but I hope you at least remember that those words are not from Eleanor Roosevelt, Marilyn Monroe, Kim Kardashian, or any other celebrity name that may be given credit. Those women have made their own histories. You can also find Kim Z. Dale on Twitter, Facebook, and Google+.